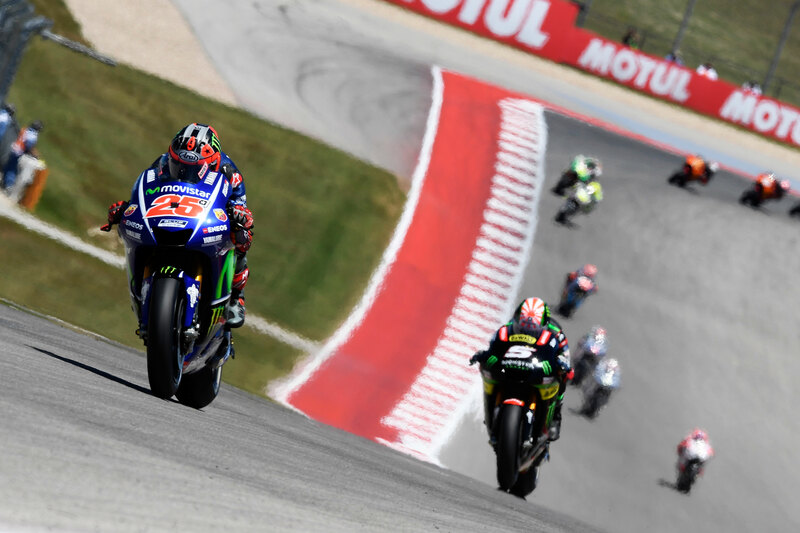 The run-up to the Red Bull Grand Prix of the Americas set the stage for a much-anticipated cage match between Yamaha phenom Maverick Viñales and Honda triple world champion Marc Marquez. All day long, the British announcing crew was breathlessly prancing about the broadcast booth, pondering the sheer wonder of it all, going absolutely hyperbolic. 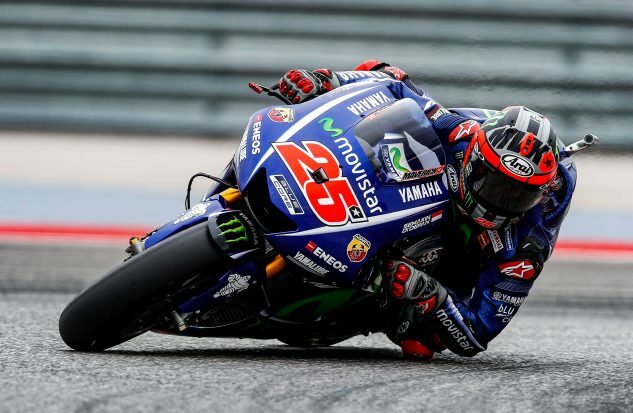 Showing no sense of the moment, Viñales crashed out of fourth place on Lap 2, letting the air out of the balloon and ceding, at least for the moment, the lead in the world championship to teammate Valentino Rossi, with Marquez suddenly back in the game. FP1: Viñales was in charge, not having received the memo about Marquez’ ownership position at COTA. FP2 was led by Marquez, snatched from Johann Zarco; Viñales right behind, trimming his cuticles. FP3 was Viñales, Dani Pedrosa, Cal Crutchlow and Marquez. Johann Zarco continues to impress, qualifying onto the second row and finishing fifth for the second-straight race. Something had to be done about the weirdness in the standings heading into Austin. Early in the season, MotoGP seemed to have fallen through the rabbit hole in Alice in Wonderland. Yamaha is just taking it to Honda – the 2016 M1 is competitive with the 2017 RC213V. All four Yamahas sit in the top 11 for the season after the opening two rounds, including the two rookies. Crutchlow led all Hondas, tied with Yamaha Tech 3 rookie Jonas Folger. Fellow rookie Johann Zarco is on the move, a mere five points behind Folger and Crutchlow. Three Ducs rest in the top ten led by, of all people, Scott Redding in fourth. Marc Marquez continued to dominate in Austin, once again taking the pole. Q2 saw a few things put right, beyond the fact that Viñales and Marquez stand head and shoulders above the rest of the field, a bunch of Aliens and wannabees slugging it out for supporting spots in the top ten. Viñales delivered the first sub-2:04 lap of the day with maybe 30 seconds left in the session. 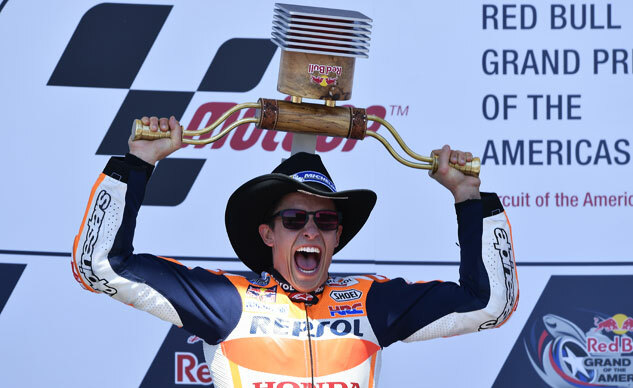 20 seconds later, Marquez flogged his Honda to a fifth straight pole in Texas, from which he had won the previous four races. Rossi snuck onto the front row late in the session, creating a second row of Dani Pedrosa, the impudent Zarco on the satellite Yamaha, and one Jorge Lorenzo, clad in white and red. Oh, and perhaps the save of the season, by Loris Baz late in the session. Laws of physics? What laws of physics? Lorenzo and Jack Miller had made it through Q1, with Lorenzo putting the Ducati as high as fourth position before settling for sixth. Zarco had been up near the top of the timesheets again all weekend, putting pressure on a lot of factory rides. Miller crashed out of Q2 and appeared to be trotting back to the garage “gingerly,” his inevitable early-season injury having possibly arrived. Pedrosa was hanging around in fourth, back to starting up front with the big dogs. 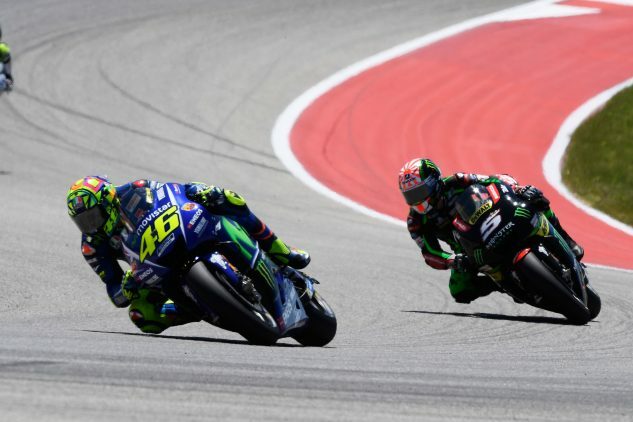 In support of my blog, Rossi and Viñales had their first set-to on Saturday during qualifying, with Viñales seemingly cheesed off about Rossi cruising on the racing line. Race Direction was later said to be considering sending a strongly-worded letter to Lin Jarvis asking him for “best efforts to prevail” upon The Franchise not to seriously injure The New Kid in Town. Maverick Viñales’ race was over after just two laps, his first mistake of his career at Yamaha. Although it took 21 laps and 45 minutes to confirm it, the race basically came down to four moves. 1) Viñales crashed late on Lap 2, leaving Pedrosa, Marquez, Rossi and Johann Zarco in the lead group. 2) Marquez took the lead from Pedrosa on Lap 9. 3) Rossi and Zarco came together a few minutes later, the Frenchman pushing Rossi wide to the right where he could cut back and increase his lead, incurring a hypothetical .3 second penalty that amounted to nothing but had the announcers, fully recovered from Viñales’ crash, happy to find something new to go mental over. 4) Rossi went through on Pedrosa on Lap 19. Johann Zarco forced Valentino Rossi to run straight through an S-curve. And while he didn’t intend to do it, Race Direction ruled Rossi still had an obligation not to gain an advantage and docked him a 0.3 second penalty. In the end, the penalty did not affect Rossi’s second-place finish. The good news for Jorge Lorenzo is he qualified sixth at COTA. The bad news is he finished ninth. With Viñales’ feet replanted in terra firma after an otherworldly start to his Yamaha career, we can now have a straightforward, adult conversation about the state of the MotoGP championship after three rounds. The factory Yamahas and Hondas appear significantly ahead of everyone else early in the season. Rossi and Viñales are frightening, Viñales for his sheer speed, Rossi for his strategic brilliance. Marquez has atoned for his crash in Argentina and will push The Boys in Blue for the entire season. The factory Ducati program is in deep yogurt, Dovizioso hanging onto fourth place by his fingernails while grasping bad luck with both hands. LCR Honda stud Cal Crutchlow continues to nose around the top of the standings, his crash at Losail all that stands between him and a top three ranking. 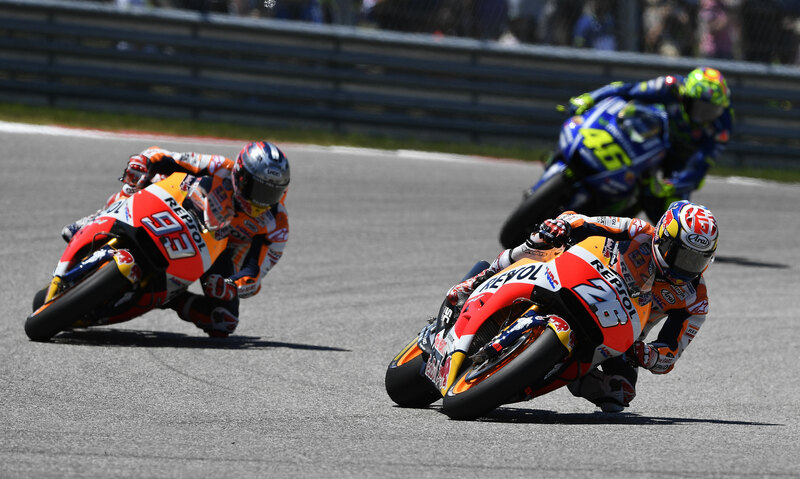 Dani Pedrosa and Marc Marquez secured their first podiums of the season. Valentino Rossi scored his third to take over the championship lead. The DNF dropped Maverick Viñales out of the points lead but he remains second by just six points and remains one of the favorites to take it all. Two weeks from now MotoGP blasts into the Spanish Riviera. The racing will be at Jerez, while the action in the evening will be on The Strip in Cadiz. Maverick Viñales, despite the good vibes associated with a return to home soil, probably will not be in the gift-giving mood in which he found himself today.